BERLIN (CNN) -- There aren't many places where history is as in-your-face as the newly restored capital of a unified Germany. For 28 years, the Berlin Wall was the starkest symbol of the Cold War. Ten years after the Wall fell -- an event that unified the city in a street party for days starting November 9, 1989 -- the past still has a vivid influence on daily lives. It starts in the morning with the heavy, acrid smell of coal, which still heats apartments in eastern Berlin as it did before the Wall came down. Even the air symbolizes an ongoing tale of two cities in one, struggling to reintegrate after four decades of division. It continues in the area where the Wall once stood, now marked by bricks in the road in front of Brandenburg Gate. The former Communist East is still rebuilding, remodeling, revamping -- a huge construction site with awful traffic jams. The Friedrichstrasse area, once grim and gray and divided by Checkpoint Charlie in what used to be the dour "worker's paradise," is becoming the Technicolor heartbeat of Germany's reborn capital. Still, it's hard to forget that this new Berlin sits atop layers of history. The heart of the Third Reich, including Hitler's bunker, lay under what used to be the no-man's land on the eastern side of the Berlin Wall. 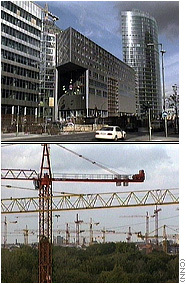 Now government offices and the glass-and-steel buildings of Potsdamer Platz are being built there. The former no-man's land is also the site for a planned Holocaust memorial. All but a few strips of the Wall have been torn down, with a debate under way about how much of them to preserve. On the world stage, the Wall's fall heralded a new and less-predictable world order, with the end of a bipolar, two-superpower world and the proliferation of regional tensions and conflicts. The Wall's absence accelerated the integration and expansion of the European Union, with a unified Germany playing a leading role. But on an individual level, as the Germans put it, the Wall remains in people's heads -- Die Mauer im Kopf. Building the Wall in 1961 made perfect sense to East German leader Walter Ulbricht. His people were fleeing to the West by the thousands every month, in a brain drain that threatened the fledgling German Democratic Republic with collapse. The flow of people from East Berlin to West Berlin had increased after the Communist regime's bloody crackdown on a workers' uprising in 1953, while West Germany barreled along with its capitalist "economic miracle," or Wirtschaftswunder. The roots of the Wall went back to the start of the Cold War, following World War II. Moscow's efforts to force the Western Allies out of West Berlin and cut off the capitalist haven by land failed, sparking the year-long Berlin airlift. On August 13, 1961, East German troops began laying bricks and barbed wire to cut off West Berlin from the rest of East Germany, except for a few checkpoints. The regime called it the "anti-fascist protection barrier," sheltering its people from the ravages of capitalism. Though the Wall circled West Berlin within East Germany, it was the world of East Berliners that stopped at the Wall. Even East German maps, which left West Berlin blank, were a kind of Orwellian attempt to blot out thoughts of the West. But that did not happen. Thousands of East Germans still tried to escape in a testament to human ingenuity. They fled in secret compartments of cars, inside surfboards, in balloons and makeshift planes. They swam Berlin lakes or canals to freedom, and tunneled their way to the West. Many attempts ended tragically. German prosecutors say East German border guards killed some 270 would-be escapees; it's estimated that in all more than 940 people died in the process of trying to flee. The two Berlins became rival showcases of the two systems. East Berlin was the Communist worker's paradise, with new high-rise apartment buildings, majestic squares, monuments and the television tower, or Fernsehturm, that still dominates Berlin today. West Berlin was an island of capitalist freedom, propped up by generous aid from West Germany. To prevent Germany from becoming a literal superpower battlefield, West German leaders such as Chancellor Willy Brandt pursued Ostpolitik, improving relations with the East through exchanges and financial support. Equally important were changes in Moscow. Mikhail Gorbachev took the helm there in 1985 and shook it up with perestroika reforms. He told Eastern bloc leaders they, too, had to change. Moscow would no longer intervene militarily to prop up their regimes. But East German leader Erich Honecker rejected Gorbachev's calls. And the East Berliners' exodus to the West resumed in earnest. In the summer of 1989, East Germans by the tens of thousands drove their Trabants to other Eastern European countries and then ditched them to flee westward. 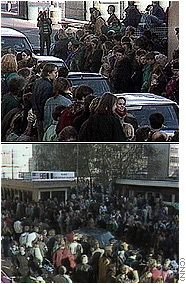 Demonstrations grew in East Germany, in Leipzig, Dresden and finally Berlin. By October 1989, on the 40th anniversary of the German Democratic Republic, crowds chanted not for Honecker but for Gorbachev. "Gorby, help us!" they cried. The Soviet leader told Honecker during an East German Politburo meeting: "He who is late will be punished by life." Honecker still resisted, and within days the Politburo replaced him with Egon Krenz. But Krenz's effort to negotiate reform with pro-democracy leaders was too little, too late. Then came the decision to allow East Germans free passage westward with visas -- a move calculated to relieve pressure on the regime, coupled with the promise of new reforms. It was a futile, last-ditch attempt to save the system. The government's spokesman announced free passage on November 9, the day before it was to take effect. But he mistakenly said the decision was effective immediately. Within hours, East German border guards threw up their hands, stopped demanding visas and allowed throngs of East Berliners through to West Berlin, beginning at Bornholmer Bridge. It was the beginning of what exploded into a cathartic outpouring of emotion, drawing together a divided people who had doubted whether they would live as one again. East Berliners were showered with gifts and even given deutschmarks by the West German government to shop for bananas, blue jeans, rock 'n' roll music and other items they had coveted for decades. 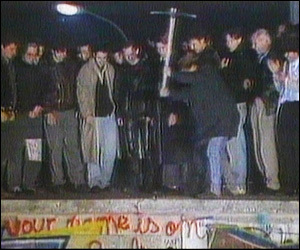 Unification came on October 3, 1990, less than a year after the Wall fell. But a truly unified Germany has yet to be. Germans still speak of the Ossies in the East and the Wessies in the West. Despite hundreds of billions of dollars in aid since unification, unemployment in the East is still double that of western Germany, as high as 20 percent in Saxony-Anhalt state. Eastern Germans are often irritated by what they call the arrogant "elbow society" of the market economy. Western Germans say the easterners are slow to learn the ways of capitalism; the westerners complain of paying higher taxes to finance eastern Germany's reconstruction. The millions who lost their jobs to capitalism turned on Chancellor Helmut Kohl, who lost last year's election. Now Kohl's successor, Gerhard Schroeder, is struggling with the same problem. A few recent polls even show some eastern Germans wouldn't mind seeing the Wall return; they along with many more of their neighbors would like to return to their former job security, generous social benefits and a slower, less consumer-oriented way of life. Along with "the Wall in the head," the Cold War legacy has played out in other ironic and colorful ways, some that divide and others that unify eastern and western Germany. Ostalgie is nostalgia for the simpler times of the old days in the East. Ostalgie parties last month marked what would have been the 50th anniversary of the German Democratic Republic. Eastern Germans dressed in green army and blue youth group uniforms, upholding a former cultural identity that has long been discredited and ridiculed by western Germans. Some symbols of East Germany have become common currency among eastern and western Berliners alike. 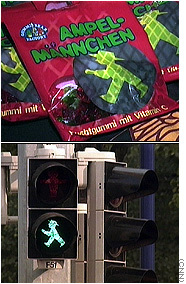 Much affection is given the Ampelman, the short, stubby crosswalk man once seen as subliminal oppression in the East, now a cute memento in the form of coffee mugs, lamps, doormats, backpacks and gummi-candy. The East's rickety plastic-body Trabant car, no longer built, is now a beloved collector's item. There are "Trabi" clubs for die-hard enthusiasts. The cars are often painted in outrageous colors as a garish fashion statement among avant-garde Berliners. Another artifact haunts Berlin -- some 1 million files of East Germany's Stasi secret police, which coerced or paid hundreds of thousands of informants. Former East Germans can now consult those files and learn who spied on them -- relatives, friends, co-workers, co-activists. Still another symbol of the Cold War has become a symbol of German unification. Glienicke Bridge, which connects western Berlin with Potsdam, was known as the "spy bridge" where East and West exchanged agents. 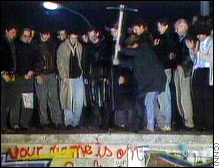 In 1989, when the Wall fell, East and West Berliners finally met each other there, justifying the name it was given shortly after World War II -- The Bridge of Unity. Once the capital that launched two world wars, once divided by a Wall built to help prop up an economic system and an empire, Berlin lives and breathes the irony, the drama and the beauty of the past as it evolves again into a world city.